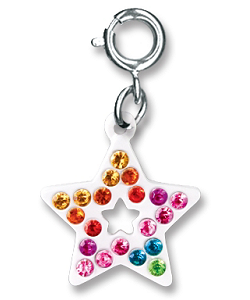 Add a splash of star power attitude to your charm bracelet with this colorful CHARM IT! 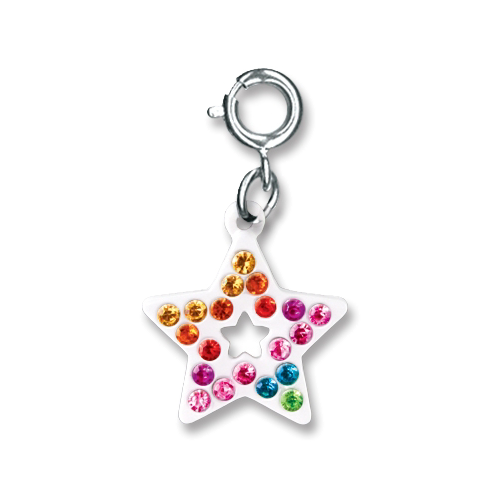 Rainbow Open Star charm. With sparkly acrylic stones in a rainbow of colors, this beautiful Rainbow Open Star charm is a die-cut delight, adding fun and fashion to your charm bracelet. With a simple snap of a clasp, you can personalize your CHARM IT! jewelry with this vibrant CHARM IT! Rainbow Open Star charm. Show your special girl that she's tops on your list with this fun A+ charm from CHARM IT! This vibrant Heart Spinner charm is reminiscent of the classic Magic 8 Ball and you spin and land on fun phrases. Let your CHARM IT! girl know she's number one in your book with this fun and festive Heart Medal charm. This exciting Girl Power! burst charm features colorful letters and hearts on a background of a glittery pink. This colorful Dream Catcher charm has a beautiful glittery magenta heart and 3 dangly "feathers" in green, pink, and turquoise.